Two years after setting the ultimate target for MLB sluggers to shoot for with 762 career home runs, Barry Bonds has decided it’s time to move on to other things. According to his agent, Jeff Borris, who commented for the record at December 9th Winter Meetings in Indianapolis, Bonds’ baseball career is officially over. "It's two years since he played his last game, and if there was any chance he'd be back in a Major League uniform, it would have happened by now," Borris said to media outlets from around the globe. "When 2008 came around, I couldn't get him a job. When 2009 came around, I couldn't get him a job. Now, 2010...I'd say it's nearly impossible. It's an unfortunate ending to a storied career." The 45-year-old hasn't played in the Majors since 2007 when he hit .276 with 28 home runs and 66 RBIs for the Giants while leading the National League with a .480 on-base percentage. But he hasn't been able to find a team since he was indicted on perjury and obstruction of justice charges after the 2007 season. The indictment alleged that he lied under oath about the use of performance-enhancing drugs. 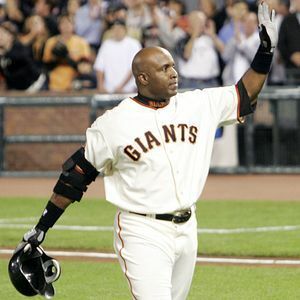 Bonds, though, remains baseball's all-time home run king with 762 career homers, and he set the single-season home run record with 73 home runs in 2001. His 2,558 walks and 688 intentional walks are also the most in baseball history. The left fielder's career would end with a .298 batting average, .444 on-base percentage and a .607 slugging percentage with 2,935 hits, 1,996 RBIs, 2,227 runs and 514 stolen bases in 2,986 games spread over 22 Major League seasons. The 14-time All-Star also won a record seven Most Valuable Player Awards, eight Gold Gloves and 12 Silver Sluggers.